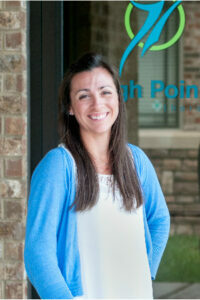 Physical Therapist ~ Jenn joined the High Pointe team in July 2016. She is a 2010 graduate of UTHSC in Memphis, TN, where she received her Doctorate in Physical Therapy. She received her Bachelors of Science from the University of Memphis in 2007 with a concentration in Exercise and Sports Science. She has obtained her Certified Orthopedic Manual Therapist certification (COMT) through Maitland-Australian Physiotherapy Seminars (MAPS). This means she has demonstrated advanced skills in manual (hands-on) therapy. She is a sports and exercise enthusiast, completing multiple half marathons, various triathlon distances, and her first full marathon in 2015. When not treating, she enjoys staying active and spending time with her family. Jenn is a native of Clarksville, and is very excited to return to her hometown to assist her friends and family with any musculoskeletal issues they may have.